I would like more information about 348 Islander Circle. Key West style townhouse in gated Islander community. Move In Ready END UNIT with extra windows for a light and airy feel! Just under 1,300sf offering 2BR/2.5BA's and attached 1 car garage! Paver drive with covered entry, rear patio and upstairs balcony. Kitchen offers solid surface counters, white cabinets, all appliances and opens to the living and dining room. Tile throughout downstairs with carpet upstairs. 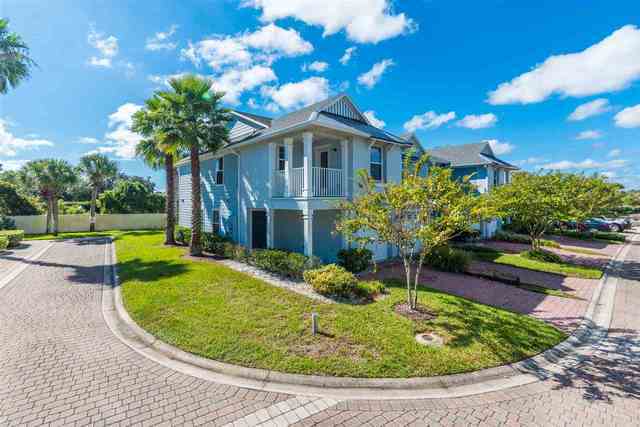 This unit is only steps from the community pool/cabana! Addnl Marketing Remarks: Convenient island location minutes to the St. Augustine Beach Pier, beach restaurants, shopping, the St. Augustine Amphitheater. Directions: SR312 to North on Mizell at All American Air. Turn right into Islander once thru gate keep going straight on Islander Drive. Stay straight and follow all the way to the end unit on the right.